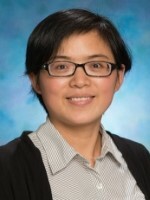 Emily Chen joined the MCEM in November 2013, coming from the Department of Materials Engineering in Monash University where she completed her PhD in 2012. Emily’s PhD topic focused on the plasticity of precipitation hardened Al alloys. It involved advanced experimentation combined with theory and modelling. During the experimental component of this work she was a frequent user of MCEM, in particular TEM. Upon completion of her PhD, Emily took up a Centre of Excellence for Research in Light Metals funded post-doctoral position in the Department of Materials Engineering in Monash University working on two topics: fatigue of precipitation hardened Al alloys and surface precipitation. In this role she continued to make extensive use of MCEM facilities and extended her expertise to SEM and FIB preparation of TEM foils. Hutchinson, C.R., de Geuser, F., Chen, Y. and Deschamps, A., "Quantitative measurements of dynamic precipitation during fatigue of an Al-Zn-Mg-(Cu) alloy using small-angle X-ray scattering", Acta Materialia, v. 74, 96-109 (2014). Chen, Y., Weyland, M. and Hutchinson, C.R., "The effect of interrupted ageing on the yield strength and uniform elongation of precipitation-hardened Al alloys", Acta Materialia, v. 61, 5877-5894 (2013). Styles, M., Hutchinson, C.R., Chen, Y., Deschamps, A. and Bastow, T.J., "The coexistence of two S (Al2CuMg) phases in Al-Cu-Mg alloys", Acta Materialia, v. 60, 6940-6951 (2012). Han, W.Z., Chen, Y., Vinogradov, A. and Hutchinson, C.R., "Dynamic precipitation during cyclic deformation of an underaged Al-Cu alloy", Materials Science and Engineering A, v. 528, 7410-7416 (2011). Zheng, F. and Chen, Y., "High temperature electrode reactions of Sr and Mg doped LaGaO3 perovskite", Journal of Materials Science, v. 43, 2058-2065 (2008). Chen, Y., Yu, R.Z., Shi, Q., Qin, J.L and Zheng, F., "Hydrothermal synthesis of hexagonal ZnO clusters", Materials Letters, v. 61, 4438-4441 (2007).